It's your choice, America—you can keep your cartels and the captured government that enables and protects them, or you can fix what's broken and unaffordable. If there is any goal that might attract support from across the political spectrum, it's creating more full-time jobs in the US But this laudable goal is dead-on-arrival (DOA) unless we first fix these four things. Why is job growth stagnating? Many point to automation, and yes, that is a systemic dynamic that will only expand going forward. But much of the stagnation is the direct result of the high costs and structural failures in these four inputs to the job market. 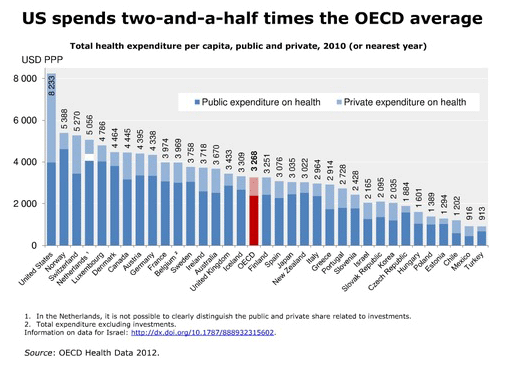 US healthcare costs more than twice as much per person as healthcare per person in our advanced-economy competitors. Why would anyone open a business in a nation so poorly run that healthcare costs twice as much as it does everywhere else? The American people are not healthy. Obesity/obesity-related diseases and opiate addiction are both epidemics. Workers struggling with lifestyle-caused chronic diseases cost more to hire and to help. 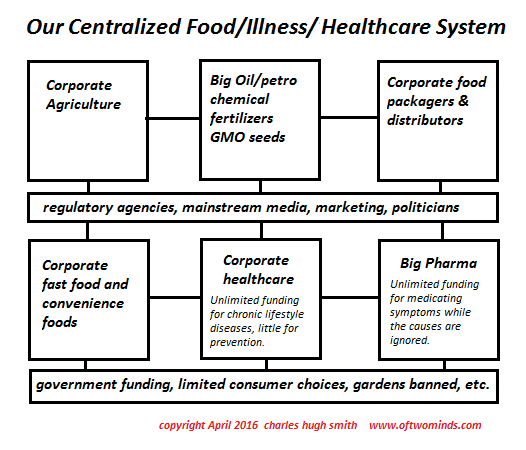 If you set out to destroy the nation's ability to create jobs, you'd impose the unaffordable healthcare system we have and the overly complex and costly tax/regulation system we have. And you'd push your students to get useless credentials instead of the real-world skills, moxie and values they need to get ahead and fulfill their potential in a fast-changing economy. Do you want to create jobs? First, fix these four things, or your goal is DOA. 3. Regulation. Weigh the cost of every regulation against the public good it generates. Include business owners, employees and citizens in the decision process—not just protected, privileged "experts" with no skin in the game, i.e. poobahs whose own fat salaries and benefits are never exposed to the costs or risks of the regulations they impose with such abandon. We spend twice as much per person yet our life expectancy and other measures of health are tanking—do you see a problem for potential employers? 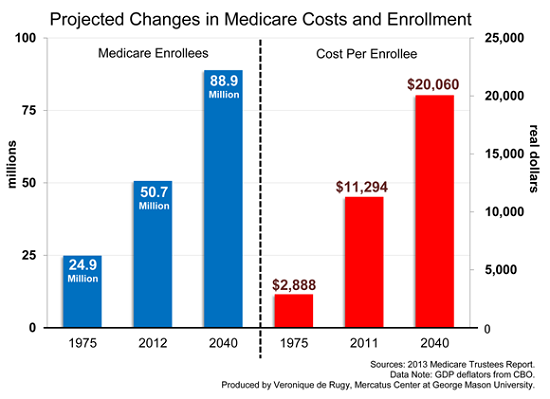 Wake up, America: either get healthy and overhaul sickcare or the nation is doomed. It really is that simple. 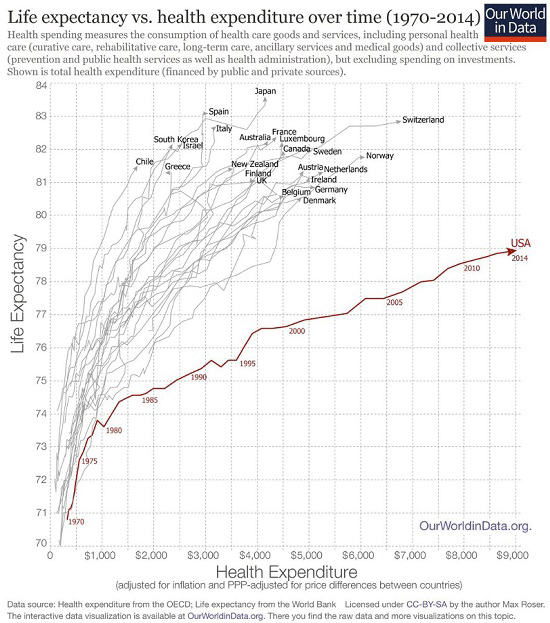 If you think this chart will gladden the hearts of potential employers, you've lost your mind: out-of-control government sickcare spending, check; rapidly aging populace of ill people, check; a political system that has been captured by insurers, Big Pharma, and every other cartel that's reaping enormous profits off a sick populace and a sick system, check. 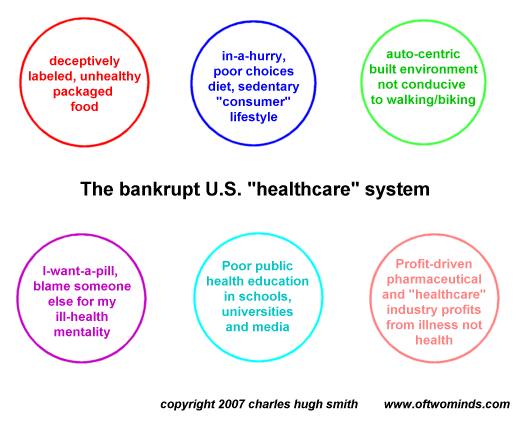 We have a simple choice: either fix these four broken systems or go down the drain. The crony-cartel-state system we have is broke and broken. It's your choice, America—you can keep your cartels and the captured government that enables and protects them, or you can fix what's broken and unaffordable.